There really is no Sat Nav. With thanks to family and friends for looking after things while we’re gone. Below is our first letter home so that we can keep in touch and share some of what we’ve seen. 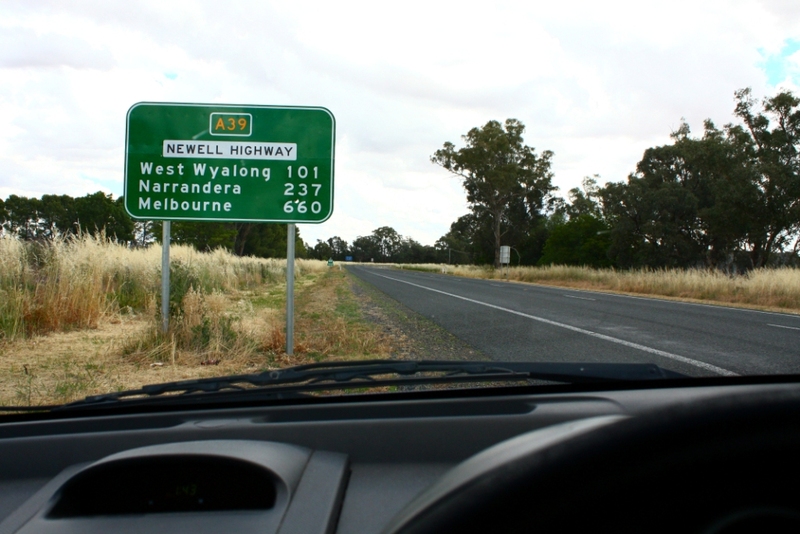 Itinerary: Parkes to Albury, via an assortment of towns and rest stops. Distance travelled: 379km plus the 15km before remembering to turn on the odometer. At one point, I looked at the meter and was startled to find we had travelled 1700k. I looked a little closer and realised that there is a decimal point in the display. I’m not sure if I was relieved or disappointed. Weather: A bit of sun, a bit of cloud and a bit of rain. At one point, there was a rain band to the left of us and a rain band to the right, but clear straight down the highway. Eventful? No. The aim of Day 1 was just to get to Albury. We left Parkes at 1pm and arrived 7:30. We didn’t get lost because Mum knew the way; she’s travelled this road many times. We stopped occasionally, but the real tourist stuff starts tomorrow when we cross the border into Victoria. My car is a small-ish 2-door and, as Mum explains, it doesn’t feel like a little car when you’re sitting in the front. One of my aims was to keep the front clear – all the mess on the back seat – to maximise that sense of spaciousness. About 2 hours in and it was obvious that idea wasn’t working. My cameras are under the passenger’s feet. Piling up in the console are the sunglasses and phone and coin and rubbish. And the door compartments are full of half-empty bags of lollies and chips. Shortly after Mum took over as driver, she described my car as “toe-y”. I asked for an explanation. Turns out, it’s a bit of a goer, not easy to keep under the speed limit. Very little was photographed today. I’m sharing this one cause it made us laugh. It’s located at the beginning of a ramp at a rest stop at Marsden. 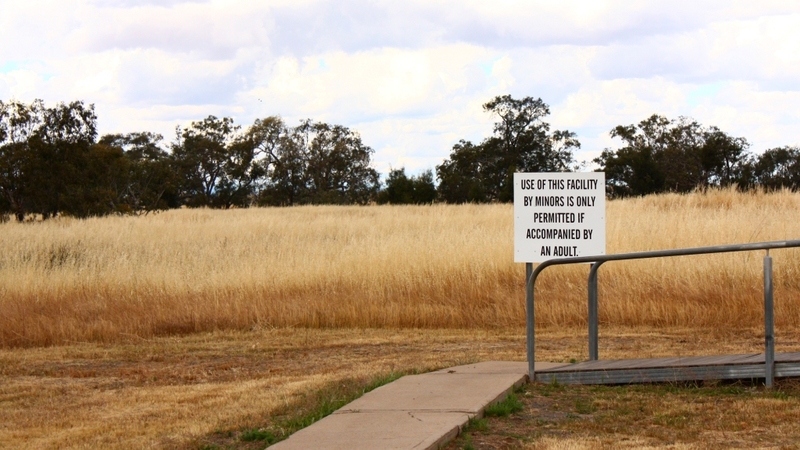 My first thought was “when did a field become a facility?” The sign was repeated at the other end of the ramp, near the doors to the drop toilet. I suspect that many travellers may not understand the potential difficulties a young child could experience if this was their first encounter with a drop toilet! I, for one, remember being terrified as a child when, even at school, we had to use such a facility. Interestingly, Mum said that, when she was growing up, the drop toilet had two holes – a big one and a little one. Thoughtful, but it did mean someone had to dig a wider pit. I promise that lavatorial facilities will not become the theme for this road trip.